New Winter 2018: This personalized Christmas ornament is one every A-D-Pi gal should have hanging from the tree this year! The Alpha Delta Pi sorority ornament personalized and glittery bright will first make her smile and then light up the room when it reflects the glow of holiday lights. As a glass personalized sorority ornament, this includes a name or names, year and special message from you, all painted on by hand in an attractive font to produce a glass Christmas ornament that will be an instant classic. 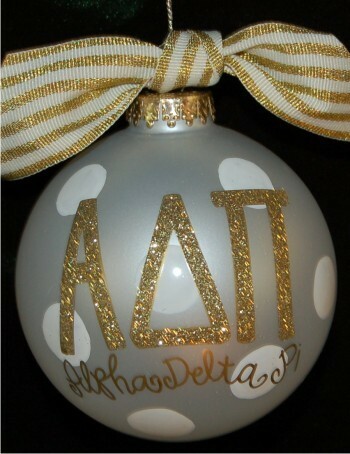 Commemorate your time or surprise a sorority sister with the Alpha Delta Pi sorority ornament personalized to be perfect.